An x-ray of a brain filled w/ bird silhouettes makes this cute design for birders & bird-lovers. Being bird-brained isn't a bad thing. 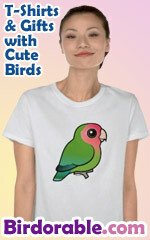 A cute gift idea for bird-obsessed birdwatchers & bird lovers!